The range of the red-ruffed lemur is Northeastern Madagascar. Red-ruffed lemurs inhabit rain forests. Red ruffed lemurs are arboreal forest dwellers. Progression is by walking or running on larger branches, and leaping from tree to tree. Locomotion is more labored and cautious than with other Lemur species. They are crepuscular, being most active from 5:00 pm to 7:00 pm, when their peculiar calls are commonly heard. Vocalizations include an intense roar of alarm, and a powerful, plaintive call for territorial expression. Group sizes can range from 2 to 16. All group members use a common home range, and aggression has been noted between groups. Females form the core of the group, and defend the territory. The weakest social bonds are between males. Grouping patterns change seasonally. Females group in larger numbers during the wet summer, and are more dispersed during the drier winter. 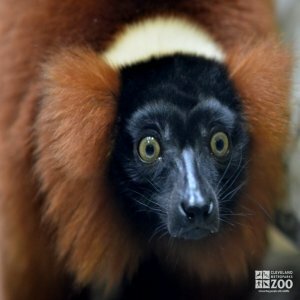 Mating season for red ruffed lemurs begins in May, with most matings being in June and July. The young are usually born in September and October. Infants are at first left in the nest, rather than being carried about by their mothers. Later they are carried in the mother's mouth, and begin to follow the mother by about 3 weeks of age. They are fully mobile at about 7 weeks. Weaning is at around 135 days. Females may become pregnant at 20 months.